In May 2016, Measurement Science and Technology—a scientific instrumentation and measurement journal—selected a PNNL-authored paper on marine energy to receive a 2015 Outstanding Paper Award. 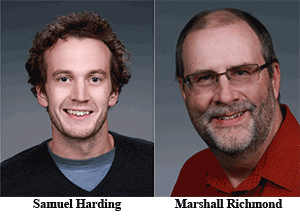 Post doctorate Samuel Harding and chief engineer Marshall Richmond collaborated with Brian Sellar of the University of Edinburgh in Scotland to author the paper, which covered a new convergent-beam technique that could increase the accuracy of measuring tidal currents around a marine hydrokinetic device. The research paper earned the award for its impact on significant improvement of underwater velocimetry. According to Measurement Science and Technology, the paper was “excellent in its clarity and scientific description, and its contents were supported by 26 references.” The journal also noted that the sophisticated idea and originality was a key factor in the paper’s selection as the winner from a competitive list of candidates. Exhibiting its popularity, the paper was downloaded more than 500 times in the first 90 days after publication. One of the factors that make this paper unique is that one of the major contributors was Harding, a post doctorate researcher. "Sam Harding did an outstanding job on the data analysis for this novel instrument, and his clear, effective writing was no doubt a major reason the paper received this award," noted Richmond. PNNL teamed up with the University of Edinburgh as part of the project, sponsored by the DOE's Wind and Water Power Program, to support sub-sea experiments by interpreting and analyzing the acoustic measurements. The result of the project was an adjusted measurement tool, a convergent-beam acoustic Doppler profiler configuration. PNNL and the University of Edinburgh expect derivatives of this system will serve as important tools in improved marine hydrokinetic characterization, and could offer new ways to investigate highly complex flow conditions such as the interaction between strong currents and ocean waves. For more information, read the recent research highlight.